As New Yorkers, I think it's easy to forget the rich culture that surrounds us daily. I go to school where the New York Times was originally published, I live in a building that was once the world's largest hotel, and I travel around the city in tubes that were built in the 1900s. If you need a gift for a history buff or just a plain old New York fan, head to NYC Subways circa 1980 for some incredible photography of our great mass transit system. Upon entry, you're greeted with rows of prints and t-shirts made from the owner, John Conn's, photography. The greatest part of this stand is the story behind each photo. 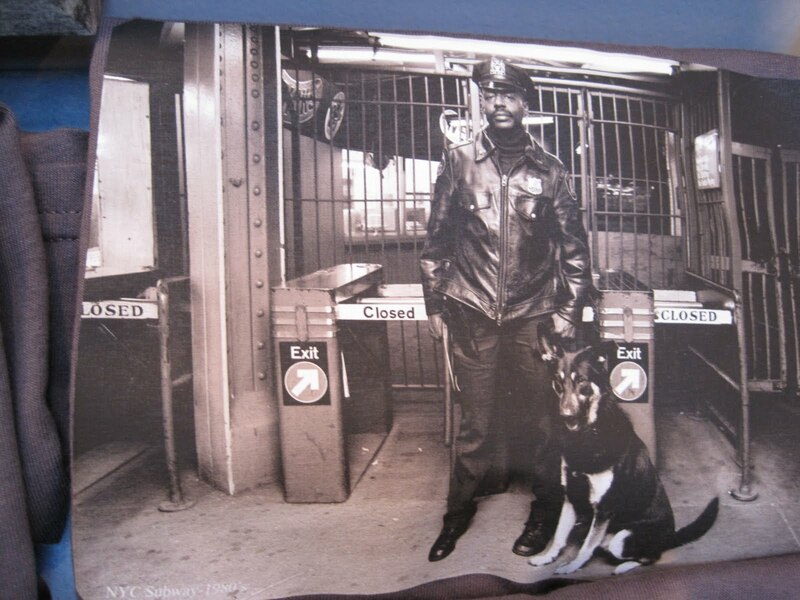 For instance, in the photo on the left the officer's name is George Washington and his dog's name is King. Officer Washington is now retired, and I'm not sure what King is up to. 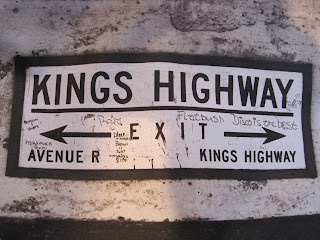 I think my favorite picture would have to be this subway sign from Kings Highway. 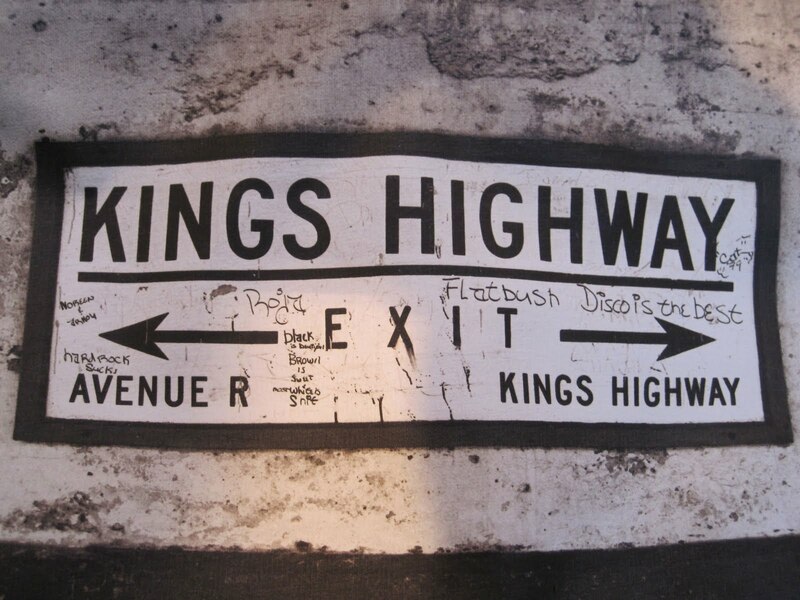 I usually ignore graffiti but how great is the line on the right side of the sign? "Disco is the best." I'm sure one of my parents wrote this. They're still under the impression that disco is the greatest genre of all time. 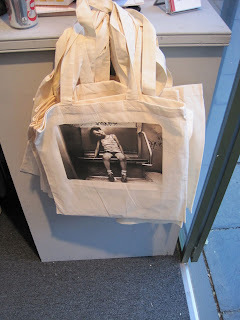 I think I might head back to this stand for a tote bag with one of John's pictures on it. The hardest part is choosing just one shot. If the picture dates from the 80's, I think King is dead, dogs don't live more than 15 years. Hmm, wonder if King has any offspring? 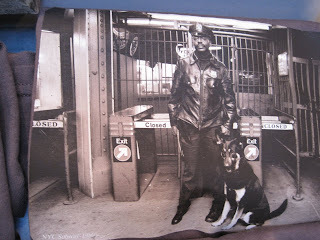 Or if the NYPD has any memorial for their working dogs? He looks like a happy, smart boy. I think I need this photo now. King's a cutie! John Conn may know more about his canine career with the NYPD. does anyone know how i can contact the owner of the nyc subway tshirt stand in bryant park? even though the stand is not up, id like to buy a tshirt and was wondering if that's possible. if you have any info, please email me at brinda.guha@gmail.com. thanks!